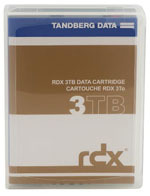 The highly anticipated RDX 3TB removable disk cartridge has been released by Tandberg Data. The Tandberg Data 3TB cartridge will be exclusive through Q1 2016. At that point, HP, Dell and others will be introducing their own licensed version of the 3TB cartridge. RDX QuikStor media-based removable disk storage offers rugged, reliable and convenient storage for back, archive and disaster recovery. with the new 3TB RDX cartridge, it provides enterprise performance and fast access, with transfer rates of up to 936 GB/hr. In addition to the release of the RDX 3TB Cartridge, BackupWorks.com is offering a FREE RDX USB 3.0 Docking Station Promotion. Purchase 3 or more RDX 3TB Cartridges and receive a USB 3.0 External RDX Docking Station absolutely FREE! This offer is valid now through year-end. Breaking the 3TB capacity is a significant milestone. Contact your BackupWorks.com Account Rep today for all your 3TB RDX removable disk storage needs.